A busy day for The Beatles, and their first – and only – EMI recording session outside the United Kingdom until the Inner Light sessions in January 1968. John Lennon and George Harrison flew back to Paris on an early flight from London, following their brief return to England the previous day. EMI's West German imprint, Electrola Gesellschaft, had been attempting to convince Brian Epstein and George Martin that they could only sell Beatles records if they were in German. The session had originally been scheduled to take place on 27 January 1964, but The Beatles had proved reluctant to attend. George Martin eventually persuaded them to fulfill the obligation, and so they entered the Pathé Marconi Studios at 62 Rue de Sèvres, in Boulogne-Billancourt near Paris, to record new versions of their two biggest hits. 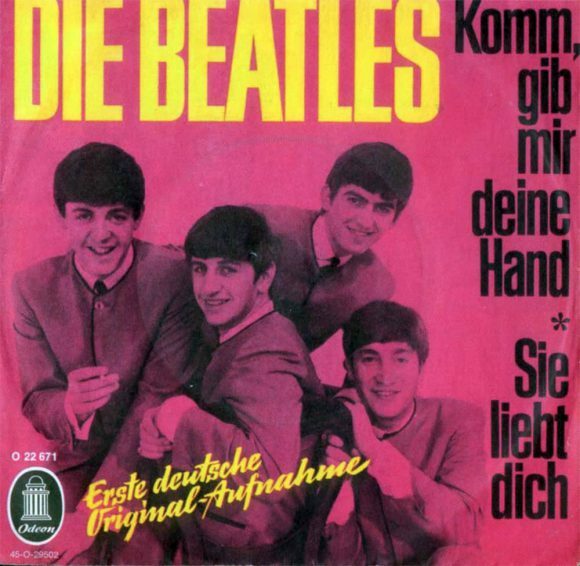 Komm, Gib Mir Deine Hand, a fairly crude reworking of I Want To Hold Your Hand, was the first to be recorded. They completed it in 11 takes, recording new vocals over the original rhythm track. Sie Liebt Dich (She Loves You) was next. The original two-track recording no longer existed, so The Beatles re-recorded the rhythm track from scratch. They did this in 13 takes, then recorded their German vocals, with the help of translator Camillo Felgen, sent to them by EMI/Odeon producer Otto Demmler. The Beatles had made quick progress, and they had time to record the rhythm track of a new song, Can't Buy Me Love, which they completed in four takes. In the evening The Beatles gave their customary two performances at the Olympia Theatre on Paris's Boulevard des Capucines. I looked for the address on Google Maps, and it is now a cheese shop? what is the physical address and website of emi parthe marconi in paris? Dear Graham, the address is 62 rue de Sèvres, not in Paris but in Boulogne-Billancourt which adjoins Paris. The studio was destroyed at the end of the 1990s. There is a underground station “Pont de Sèvres” very near of this place where is a supermarket instead. the address of EMI Pathé-Marconi was 62, rue de Sèvres at Boulogne-Billancourt wich adjoins Paris. The studio was dismantled in the end of 1990s.